A crossover sport van for those with multifaceted lifestyle, the Uplander delivers the bold styling of an SUV, the passenger room and interior versatility of a van, and the smooth ride of a sedan. It enters the 2008 model year with more standard safety and convenience features, including a tire pressure monitoring system and XM Satellite Radio. The front-wheel-drive Uplander is offered in regular- and extended-length body styles, and can seat up to seven passengers. The retail lineup includes LS and LT models, as well as a commercial-use cargo van. Safety features include dual-stage frontal air bags with GM’s Passenger Sensing System and available side-impact air bags for the first- and second-row outboard seating positions. New for 2008, all Uplander models come with a standard tire pressure monitoring system. Also, StabiliTrak electronic stability control system is now standard on all models. 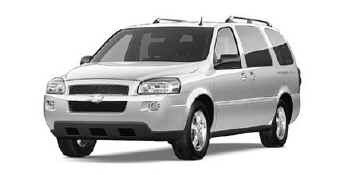 The ‘08 Chevy Uplander is powered by a sophisticated 3.9L V-6 that uses variable valve timing to optimize performance and fuel efficiency. The 3.9L engine delivers 240 horsepower (179 kW), 240 lb.-ft. (325 Nm) of torque* and a FlexFuel version that’s capable of running on E85 ethanol is available. New exterior color: Ink Slate Metallic. The 3.9L V-6 VVT is a sophisticated powerplant that uses premium-engine features, such as variable valve timing and active intake technology, to deliver optimal performance and economy. The engine provides broad power across the rpm range, with 90 percent of torque available from 1,800 rpm to 5,800 rpm; it is paired with a smooth-shifting four-speed automatic overdrive transmission. A FlexFuel version of the 3.9L engine that is capable of running on E85 ethanol fuel is available. E85 is a blend of 85 percent ethyl alcohol (ethanol) and 15 percent gasoline. It delivers similar driving performance as regular gasoline and is a renewable, domestically produced fuel made from the starch and sugar in agricultural products – primarily corn. E85 also burns cleaner than regular gasoline, which reduces greenhouse gas emissions. GM vehicles with E85 capability can run on 100 percent gasoline or on E85 or any combination of the two. GM is a leader in advancing E85 technology and use. Uplander’s powertrain works in concert with the chassis to deliver a more car-like driving experience. The front suspension features an independent design with MacPherson struts and a stabilizer bar, while the rear suspension uses aluminum short and long ( SLA ) control arms, along with automatic load-leveling shock absorbers. The load-leveling rear suspension enhances stability, particularly when cornering over rough pavement. A standard four-wheel anti-lock disc brake system, 17-inch wheels and tires and a rigid chassis structure also contribute to Uplander’s smooth and precise driving characteristics. Uplander also features StabiliTrak, GM’s advanced electronic stability control system, as standard equipment on all passenger and cargo models. It assists the vehicle in maintaining the driver’s intended path by applying a brake force at any corner of the vehicle independent of the driver’s use of the brake pedal. StabiliTrak is integrated with the traction control and standard ABS brake systems. Uplander has as a long list of standard comfort and convenience features, including air conditioning, power windows and power door locks, tilt-adjustable steering column, and an AM/FM stereo with CD and MP3 player. All radios (except navigation) are now equipped with an auxiliary jack for iPod/MP3 input and XM Satellite Radio is now standard on all models. Uplander also offers a DVD player with flip-down screen, integrated controls and the “tri-mode” feature, which allows passengers to listen to as many as three separate entertainment sources simultaneously – DVD, CD and radio – through the speakers and dual-channel wireless headphones. For 2008, the system features a larger, eight-inch screen. The rear entertainment system is standard on LT models and available on LS. Innovative and clever storage solutions are found throughout Uplander, starting with the innovative overhead rail system, which integrates lighting and rear HVAC/audio controls – as well as features such as the rear-seat entertainment/DVD system – into a single unit. Second-row captain’s chairs are standard on LT models. On models with second-row captain’s chairs, available convenience trays with pop-up beverage holders between the first- and second-row seats fold easily out of the way for pass-through between seats. A second-row console is available as a dealer-installed accessory on models equipped with second-row bucket seats. LS models include removable modular second-row bucket seats. An integral child seat is available on LS models. With comfortable seating for up to seven, Uplander offers numerous passenger and cargo space configurations. Both the second- and third-row seats are foldable and removable. Second-row bucket seats can be folded and tumbled up against the front seats for increased cargo space, and the third-row fold-flat bench seat has a 50/50 split for added passenger/cargo flexibility. Overall, there is up to 136.5 cubic feet (3,865 L) of cargo space. Uplander is engineered to be among the safest vehicles in the mid-van segment, and is designed for outstanding performance in real-world crashes. Notable features include structural enhancements to the frame using high-strength steel. A long front-end compartment provides a large crush zone to preserve interior space, while longer and stronger engine compartment side frame rails increase energy absorption in the event of a frontal impact. All seven seating positions have three-point safety belts. Retractors for front seating positions have built-in load limiters that allow a controlled amount of give in the belt, thereby reducing the peak load on the chest during the “ride down” in a crash. The Uplander also has pretensioners in the front safety belt system that deploy at the same time as the frontal air bags to take up slack in the safety belt webbing. Pretensioners also help reduce the amount of occupant movement in the event of a crash to help reduce the risk of injury. The Uplander is equipped with the LATCH (Lower Anchors and Tethers for CHildren) system in all second-row seating positions. This system provides two lower anchors and a top tether anchor to be used to secure a child seat to the vehicle seat structure. A top tether is also provided in the center position of the third row. These anchorages are designed to make it easier to properly install compatible child safety seats. Standard, frontal dual-stage air bags for both driver and front passenger are complemented with available side-impact air bags for the first- and second-row outboard seating positions. The Uplander also has GM’s Passenger Sensing System, which uses the latest sensing technology to turn the front passenger air bag on or off. If the sensor system detects an unoccupied front passenger seat or the presence of a smaller occupant, the front passenger air bag is designed to automatically turn off so it would not deploy in the event of a frontal collision. A status indicator on the instrument panel alerts occupants that the passenger air bag is on or off. Even with this system, GM strongly recommends to restrain child passengers in an appropriate child seat placed in the second or third row of the vehicle. The second-row seats in LT models are not removable when the vehicle is equipped with the available side-impact air bags. The OnStar system is standard on Uplande, including one-year of Directions & Connections service and available Turn-by-Turn Navigation. OnStar Turn-by-Turn Navigation is the first factory-installed, fully integrated GPS navigation system from OnStar (additional monthly fee required). Turn-by-Turn allows consumers to talk to a live advisor, who in turn sends complete step-by-step directions to customers' vehicles through their OnStar system. These audio directions automatically play through the vehicle’s stereo as needed, triggered by the OnStar system’s GPS capabilities. This enables drivers to be led to their destination while keeping their hands on the wheel and eyes on the road. For more information about OnStar, see the OnStar Overview in the Product Information Guide corporate section. A range of Mobility packages is available for Uplander, for customers who transport passengers or themselves but need easier access to enter or exit a vehicle. One such feature is a dealer-installed Sit-N-Lift power seat. Operated by a hand-held remote control, this innovative seat rotates and extends out from the right side of the vehicle’s second-row seating area to provide easy transfer from a standing position or from a wheelchair. The Sit-N-Lift seat is mounted in the original seat attachments and is installed in place of the second-row passenger seat. Available as a regular production accessory and as an accessory kit through GM Accessories, Sit-N-Lift requires no permanent vehicle modifications.